Size: 12.8" x 8.4" x 2.9"
The €-2006 office printing calculator is an unusual design. It combines an outstanding 14.digit calculating capability with an Euro currency conversion and a convenient tax function. All of the 11 yet defined exchange rates are preprogrammed in the calculator, 4 additional ones could be added later. The home country is selected with the Select-key. Two additional keys allow the conversion in both directions. Don't miss the smaller sibling €-2004, €-2005 and €-5032. 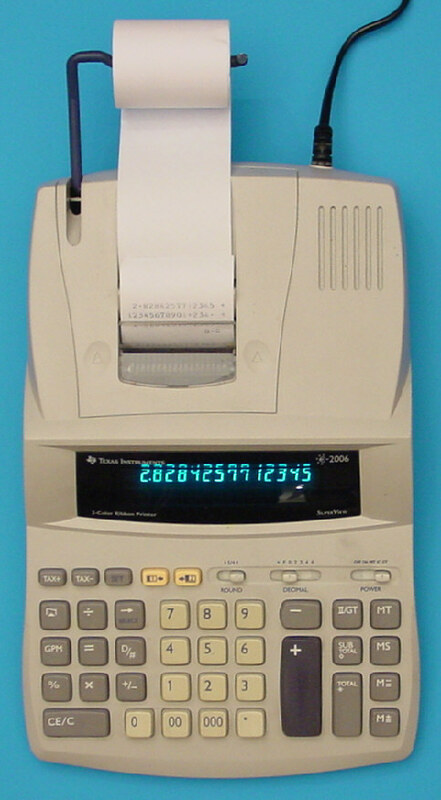 Non-printing desktop calculators with Euro conversion were introduced with the €-1796, €-2002+ and €-2003.